Thanks for the update, checking it out now. Also, gifted 2 copies of V2 to relatives, they loved it. Best looking app in the play store and best app I've ever bought. I don't know this will work, but you may try it. What I've done is rebooting my phone, then open PA, enable hires output without playing any song on PA. Now, the hires output works on my earphone ? Please disable Blur Background in Lock Screen Settings. 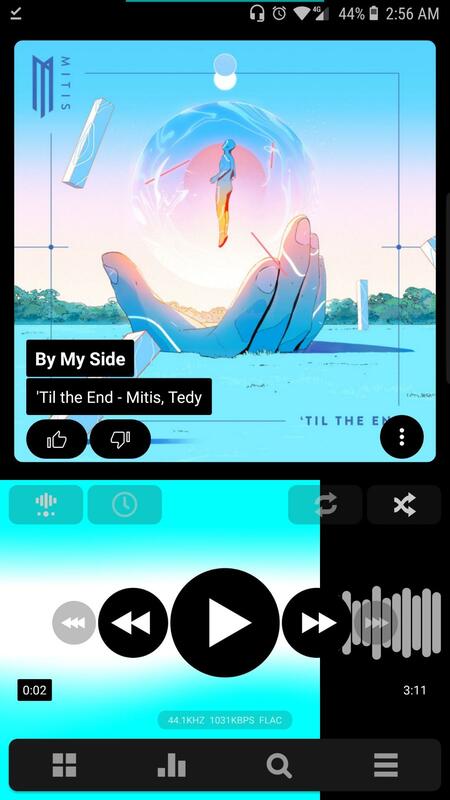 Use menu on main screen (3 dots on album art) for Albums / Artists / Folder buttons. thanks, didn't think of the Blur Background option! It will work only for some time, after you unplug the headset and use another program with another volume level and plug the phones back, the sound will play from the dynamics, and you have to reboot the phone to get rid of that. Haters gonna hate..but totally worth the wait. Thanks @maxmp ? ? 1. Will You plan to add hieracity ? Without it hard to use (artist1(cd1\cd2), artist2(cd1,cd2) - now show cd1,cd1,cd2,cd2. 2. List view even in very-small option shows strange - or icon must be smaller, or text bigger - looks like undone. 3. Hard to get to seekbar through buttons. I need and buttons and seekbar. Turns out the shuffle isnt working when i press the shuffle icon from a playlist. The shuffle every song in the library feature works but not the playlist specific ones. 2. Right, one some devices with rather low DPI (or raised scaling), font sizes are not ideal, that will be polished. 3. That is why skin dev. documentation for 3rd party skin developers is my priority after the v3 release. Same on the HTC 10. Thanks for hint about hieracity. May I ask one more? It 709 version header was static - were usable. Now it scrools with content and not very usable - cannot see where i am and cannot press header for moving back. I wasn't happy with the way the library worked. Took me a while to find the hierarchy option. The option is hard to find and I don't understand why it isn't the default for folders. Firstly, is there no way to go to folders hierarchy instead of albums when clicking on the album art? Secondly, and this one is the worst, when no album art is found for the current folder, can it look in lower folders and use what it finds there? My artist folders went from having album art in the previous version to no art at all. Thanks for hard work. I got beta build 793 from play store. Works great on non-root Samsung Note8 os 8.0; the only thing I've noticed is that the play buttons and titles are not formatted for split screen vertically or horizontally. But thanks again for all your hard work. I really enjoy the new ui. Now it scrools with content and ﻿not very usable - cannot see where i am and cannot press header for moving back. Do you mean the Seekbar? Go to Settings > Look and Feel > Skin --- then set it to "Static Seekbar"